The fire at Grenfell Tower on the Lancaster West Estate was reported at 12:54 BST and about 200 firefighters are still tackling the blaze. The Met Police said people were being treated for “a range of injuries”. 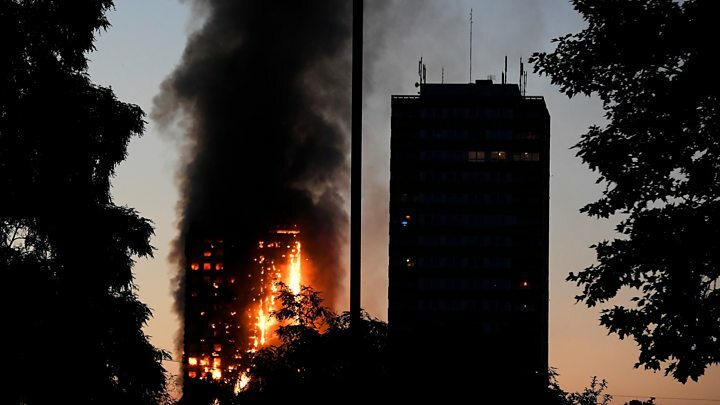 The BBC’s Andy Moore said the whole tower block had been alight and there were fears the building might collapse. BBC correspondent Simon Lederman said he understood “a significant number of people” were unaccounted for. Forty fire engines have been sent to the tower, and Mayor of London Sadiq Khan said a “major incident” had been declared. Eyewitnesses said they have seen lights – thought to be mobile phones or torches – flashing at the top of the block of flats. Others says residents – thought to be trapped inside – have been seen coming to their windows. 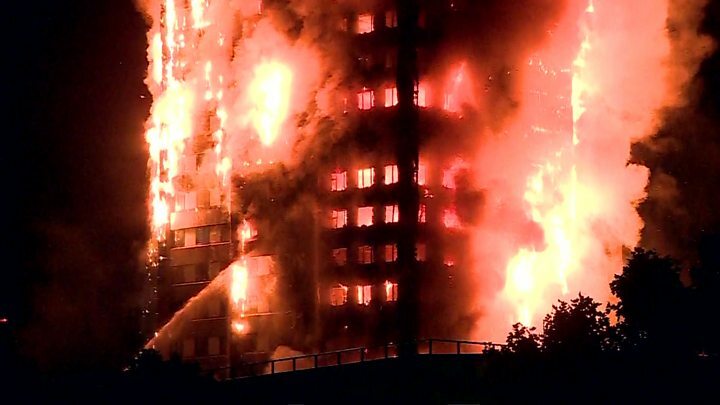 He said the tower could be seen burning “from miles away”, adding that the building had been “burning out of control”, from the tenth floor onwards. Andy Moore added: “We’ve seen debris falling from the building, we’ve heard explosions, we’ve heard the sound of glass breaking. London Fire Brigade assistant commissioner Dan Daly said firefighters were “working extremely hard in very difficult conditions to tackle this fire”. One eyewitness, George Clarke, the presenter of Channel 4 TV programme Amazing Spaces, told Radio 5 Live: “I’m getting covered in ash, that’s how bad it is. “I’m 100 metres away and I’m absolutely covered in ash. 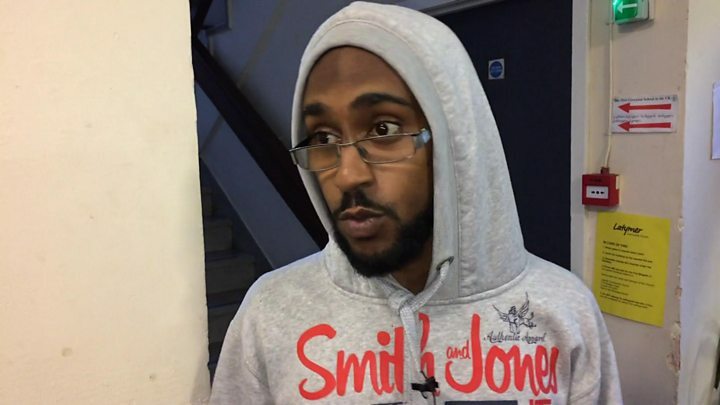 He said he was shouting at people to “get out, get out” but that residents were shouting back that they were stuck as corridors inside the building were filled with smoke. Tim Downie, another eyewitness, told the BBC part of the building was “completely burned away”. “It has burned through to its very core,” he said. “It looks very bad, very very bad. I’ve never seen anything like this. It’s just such a big fire. Safiyah, who is about 500m away from the building, said: “There are lots of people gathered in the street. I just see more and more flames burning and tragically I hear people crying for help. The local Grenfell Action Group has claimed since 2013 that the block constituted a fire risk and residents had warned that access to the site for emergency vehicles was “severely restricted”.